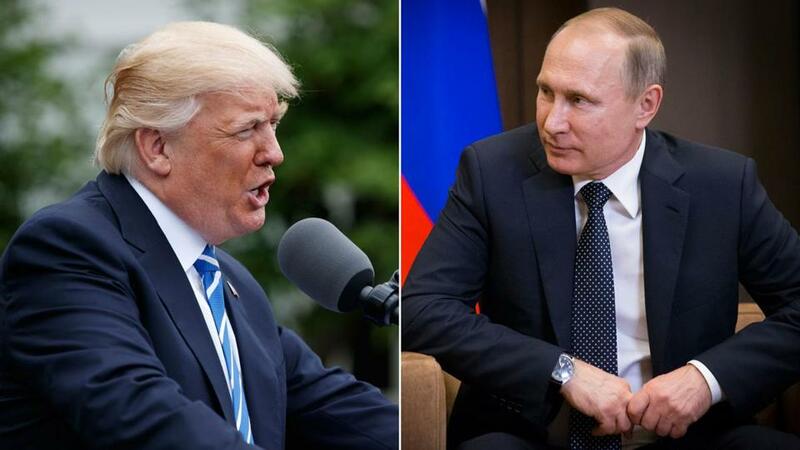 US President Donald Trump (left) and Russian President Vladimir Putin spoke on the phone Tuesday. President Donald Trump and Russian President Vladimir Putin signaled the prospect of increased cooperation in Syria Tuesday, in what the White House called a ‘‘very good’’ phone discussion that included a focus on setting up safe zones in the war-torn nation. The Kremlin characterized the call as ‘‘business-like’’ and ‘‘constructive.’’ It made no mention of safe zones. Hillary Clinton, Trump’s vanquished Democratic opponent, said during a speaking appearance Tuesday that she was ‘‘on the way to winning’’ the election until ‘‘intervening events’’ in the campaign’s final days, including WikiLeaks’ release of hacked emails from one of her top advisers. U.S. intelligence agencies have assessed that Russia was behind the hacking. Putin, who met earlier Tuesday with German Chancellor Angela Merkel, denied that Moscow ever interferes in other countries’ elections. He said accusations of Russian meddling aimed at helping Trump in his race against Democrat Hillary Clinton were ‘‘simply rumors’’ being used as part of a political fight in Washington.